Be careful not to underestimate the trails. Always check the weather before you leave, let someone know where you are going. TECHNICAL EQUIPMENT- Bring flat tires repair kit. - Mechanical mediums in perfect condition. - Dress appropriately for the MTB. - First aid kit. - Helmet required. Remember that even a simple flat tire can be a big problem. On paved roads avoid proceeding side by side and obstruct traffic. And now, fastened helmet on your head ... and enjoy! Ring of Orimento with departure and arrival in Centro Valle Intelvi, loc. San Fedele. Demanding route to cycle 95% of around 40 km, only for experienced bikers. References: from Centro Valle Intelvi, locality of San Fedele, towards the locality of Casasco, Colli Fioriti, take the trail to the left, Cerano, trail for the Church of Santa Maria, trail in the woods to Pian delle Alpi, Prabello refuge, refuge C.Bruno, Baita Orimento, Trenches of Belloni trail, Alpe Nuovo, arriving in Centro Valle Intelvi, loc. San Fedele. Ring of Ponna: simple path, pedaled 100%, about 7 km. Also suitable for families. References: Departure from Ponna, Tellero, Brugheria, Roccolo, Dosso Prai, Tellero, returning to Ponna. Path entirely marked by yellow directional arrows. 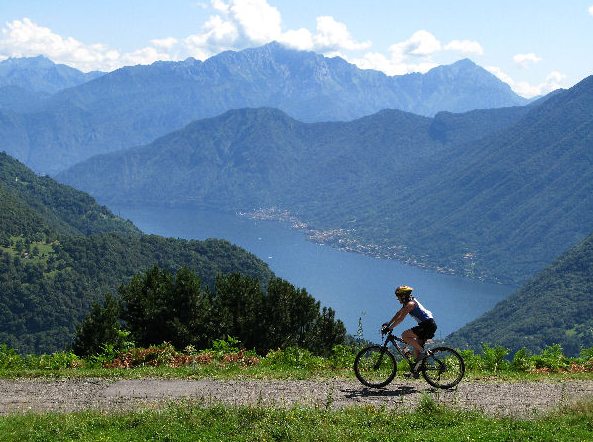 Argegno, Monte di Lenno, Argegno: very challenging path to cycle 90% of around 45 km. Only suitable for trained bikers. References: Starting from Argegno, you climb to San Fedele and then Pigra through the provincial road; or go up comfortably by cable car up to Pigra. Climbing up the mountain you reach Alpe di Colonno, Boffalora hut and Venini refuge. From here, a very challenging path starts up to the neighboring trenches of the Cadorna line; continue on the right on the former military road that bypasses the monte di Tremezzo, always descending and keeping to the right until you reach a suggestive tunnel, that can be crossed in the dark because you can see the exit, and come out onto a beautiful rocky gorge. Continuing straight on the main track you can get to Croce di Menaggio on the bike and then you easily get to Porlezza. loc. Lanzo, Sighignola, Lanzo, loc. Ramponio, Casle, loc. Lanzo: simple path, it can be pedaled for the 100%, about 22 km long. Also suitable for less trained bikers. References: From Alta Valle Intelvi, loc. Lanzo, starting from the old ski lift beginning point, it is easy to reach the summit of Mount Sighignola through both path and road, which passes close to the ski lift arrival station. At the top of the mountain you find the square called "Balcony of Italy", with its beautiful view of the Grison alps until the Monviso and some of the Apennines. Descend along the fast paved road to the locality of Lanzo, towards the location of Ramponio “Caslè”, a 5 km-long ring. There, you can seethe prehistoric “Massi Cuppelliformi”, and then have a look at the center of the small village, then back to locality of Lanzo through the road. 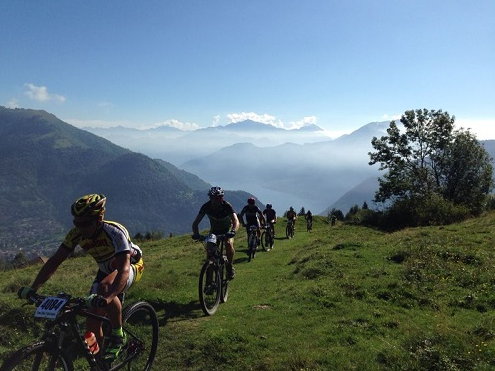 Argegno - Pigra: Challenging trail for experienced bikers, mountain bikes and enduro. The Mulattiera (old mule path) that connects the mountains to the lake runs on a very scenic route with a 1 hour and a half descent with 600 mts of height difference. 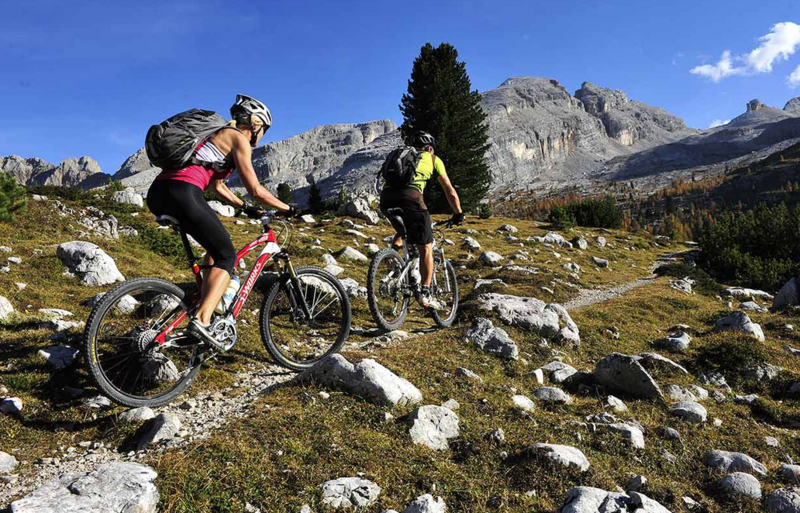 References: starting from Argegno, take the cable car up to Pigra and from the village church you can descend with a thrilling ride well suited to fans of mountain- bikes, cross the small town of Muronico and reach Argegno. loc. San Fedele, Ermogna, Capanna Bruno, Orimento, loc. San Fedele: Beautiful and scenic route, beloved by the competitors of the Annual TB Race Valle Intelvi during the past four years (approximately 200 people every year!). It stretches for about 30 km, pedaled un to the 95%, it is a challenging route only for trained biker if performed with a race pace, but definitely enjoyable for anyone who loves the sport if taken calmly. Departure from Centro Valle Intelvi, from the main square of the locality of San Fedele (Piazza Carminati); you can reach the locality of Casasco on an asphalted road and continue to the Pian dell’Alpe. 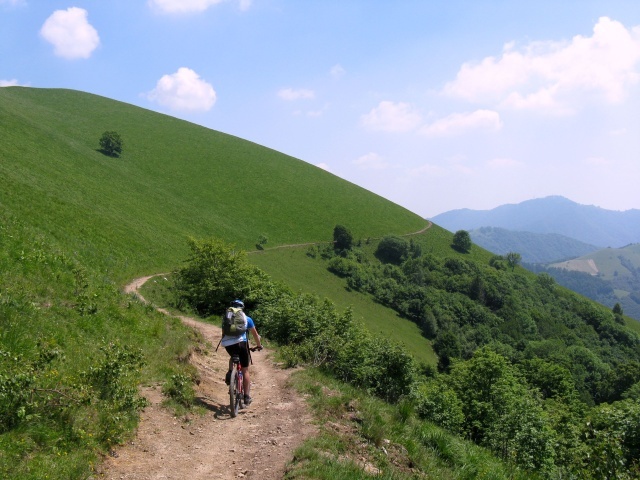 From here, the trail rises and touches the rural locations of Ermogna, Carolza, Capanna Bruno, Mater, Orimento; then, a steep section through the woods leads to the Alpe Nuovo, and then the descent take you to Lissiga location, in the locality of Pellio (Alta Valle Intelvi), with its farm. Take the provincial road to go back to Centro Valle Intelvi (locality of San Fedele).